Spices are considered as sexual invigorators in the Unani System of Medicine. In order to explore the sexual function improving effect of Myristica fragrans Houtt. (nutmeg) and Syzygium aromaticum (L) Merr. & Perry. (clove) an experimental study was conducted in normal male mice. The extracts (50% ethanolic) of nutmeg and clove were administered (500 mg/kg; p.o.) to different groups of male Swiss mice. Mounting behaviour, mating performance, and general short term toxicity of the test drugs were determined and compared with the standard drug Penegra (Sildenafil citrate). The extracts of the nutmeg and clove were found to stimulate the mounting behaviour of male mice, and also to significantly increase their mating performance. The drugs were devoid of any conspicuous general short term toxicity. The extracts (50% ethanolic) of nutmeg and clove enhanced the sexual behaviour of male mice. Aphrodisiac agents are used to modify the impaired sexual functions of human beings. These agents have been used since a pretty long time and there are enough evidence showing their use by the ancient Greek and Arab physicians eg. Hippocrat (460 B.C. ), Dioscorides (70 A.D.), Raazi (926 A.D.), Ibn-e-Sina (1038 A.D.) etc. The availability of the large number of sexual function improving drugs in the traditional Unani System of Medicine is a unique and distinctive feature of this system. Besides having many specific drugs for enhancing sexual functions, there are certain most commonly used spices like Myristica fragrans Houtt, (Nutmeg) Syzygium aromatium (L) Merr. & Perry. (clove) and Piper nigrum. Linn. (black paper) etc. which are empirically used as promising aphrodisiacs in traditional medicine practice in cases of sexual debility or depressed desire . Nutmeg is dried kernel of broadly ovoid seed of Myristica fragrans Houtt (Family: Myristicaceae) a bushy evergreen tree about 10–20 m. in height indigenous to India, Indonesia and Srilanka [2–4]. It has been mentioned in ethnomedical literature as aphrodisiac [5, 6], stomachic, carminative , tonic  and nervous stimulant . It is useful in paralysis  and increase blood circulation [11, 12]. Nutmeg contains 30–40% fats and by expression it yields a product known as nutmeg butter, this consists of 12.5% of volatile oil. The volatile oil contains pinene and camphene (80%), eugenol and myristicin, etc . Clove is the dried bud of Syzygium aromaticum Merr. & Perry. (Family: Myrtaceae) an evergreen tree 10–20 m. in height indigenous to India, Indonesia, Zanzibar, Mauritius and Ceylon. Clove are reported as aphrodisiac [14, 15], stomachic [16, 17], carminative, nervous stimulant  and tonic . It contains volatile oil (14–21%), Tannin (10–13%), phenol, sesquetrepen ester and alcohol etc . Nutmeg and Clove have not been evaluated in depth for their pharmacological properties, inspite of their traditional use in numerous medical conditions. The traditional use indicates that Nutmeg and Clove are having several pharmacological properties. It has been reported that several unani formulations containing Nutmeg and Clove were used as aphrodisiacs . However, claim of their efficacy is yet to be scientifically substantiated. In the present study the effects of 50% ethanolic extracts of Nutmeg and Clove were evaluated experimentally and compared with the standard drug Penegra (Sildenafil citrate). The authenticated sample of dried Nutmeg of Myristica fragrans Houtt and buds (Clove) of Syzygium aromaticum Merr. & Perry. were procured from the market (Delhi, India), and the standard reference drug Penegra (Sildenafil citrate) was obtained from Zydus Cadila (Ahmadabad, India). To prepare 50% ethanolic extracts of Nutmeg and Clove, 50 g. powder of each drug was extracted with 200 ml of distilled water and 200 ml of absolute alcohol (v/v) by a soxhlet apparatus. The extracts were filtered, and the filtrates were evaporated to dryness at low temperature under reduced pressure. The yield of 50% ethanolic extracts thus obtained was approximately 7.6 g. for Nutmeg and 5.4 g. for Clove. The test drugs were administered to the animals and the doses of 500 mg /kg; p.o. were selected according to Dhawan  multiplying the Unani clinical dose with the conversion factor of 12. The dose of the referent drug (5 mg/kg; p.o.) was also calculated in the same manner. Adult Swiss mice (25–35 g.) were used for the study. The animals were housed under standard laboratory conditions (relative humidity 65 ± 2%, temperature 23 ± 2°C and 12 h light: dark cycle.) They were fed with standard rodent pellet diet (Gold Mohar, Lipton-India, Ltd.) and tap water ad libitum. The study was approved by the departmental ethical committee for animal care and use. Mount is operationally defined as the male assuming the copulatory position but failing to achieve intromission. To quantify mounting behaviour, non-oestrous female mice were paired with males treated with single dose of the drugs (500 mg/kg; p.o.). Animals were observed for 3 hrs and their behaviours were scored as described . Males were placed individually in a glass cage. After 15 minutes of acclimatization, a non-oestrous female was introduced into the arena. The number of mounts were recorded during a 15 minutes observation period at the start of 1st hr. Then the female was separated for 105 minutes. Again the female was introduced and the number of mounts was observed for 15 minutes as before at 3rd hr. All the experiments were performed between 09.00 to 12.00 hrs during day time at room temperature 26–27°C. To determine the effects of Nutmeg, Clove and Penegra on mounting four groups of six animals each were taken for the study. All drugs were dissolved in distilled water just before the administration. The first group received distilled water (10 ml/kg; p.o.) and served as control. Groups II and III were given the extracts of Nutmeg (500 mg/kg; p.o.) and Clove (500 mg/kg; p.o.) respectively, while the group IV received Penegra (5 mg/kg; p.o.) and served as standard. Male mice divided into 4 groups of six each were used in the study. Group I served as control and received distilled water (10 ml/kg;p.o.). Group II and III were administered extract of Nutmeg (500 mg/kg; p.o.) and Clove (500 mg/kg; p.o.) while group IV received Penegra (5 mg/kg; p.o.) and served as standard. The drugs were administered in the evening (17.00 – 18.00 h.) and each male was placed in a separate cage. After 1 hr, five oestrous female were admitted into each cage and they were cohabitated overnight. The stage of the oestrous cycle was determined according to the criteria laid down by Ecksterin et. al. . The vaginal smear of each female mouse was examined under a microscope for the presence of sperm. The number of sperm positive female was recorded in each group. To determine general short term toxicity, the animals were divided into 3 groups, each containing 6 mice. Group I animals served as control and received distilled water in an identical manner. The groups II & III were given extract of Nutmeg (500 mg/kg; p.o.) and Clove (500 mg/kg; p.o.) respectively. The animals were observed continuously for 1 hr for any gross behavioural changes or death, if any, and intermittently for the next 6 hrs and then again at 24 hrs after drug administration. The behavioural parameters like convulsions, hyper activity, sedation, grooming, loss of righting reflex and increased respiration were observed. The test drugs Nutmeg & Clove and standard drug Penegra treated male mice, 1 hr after the treatment as well as 3 hrs after the treatment, displayed excessive mounting behaviour as 5.00 ± 1.15 (P < 0.01), 6.16 ± 12.10 (P < 0.01) in the group treated with Nutmeg and 3.50 ± 1.70 (P < 0.01), 2.33 ± 0.94 (P < 0.01) in the group treated with Clove and 13.16 ± 3.02 (P < 0.001), 5.66 ± 2.05 (P < 0.01) in the group treated with Penegra as compared to control (1.16 ± 0.68, 0.83 ± 1.06). However, this activity was found to a higher extent in the group treated with the standard drug. It was also observed that mounting behaviour activity (no. of mounts) in Nutmeg group, at 1st hr and 3rd hrs, was greater than Clove. Both the test drugs produced significant increase in mounting behaviour of animals. The 50% ethanolic extract of test drugs Nutmeg (500 mg/kg; p.o. )and Clove (500 mg/kg; p.o.) and standard drug Penegra (5 mg/kg p.o.) at 1st or 3rd hrs after treatment increased the number of mounts by 431.03%, 742.89% (5.00 ± 1.15, 6.16 ± 12.10), 301.72%, 280.72% (3.50 ± 1.70,2.33 ± 0.94) and 1135%, 702.77% (13.16 ± 3.02, 5.66 ± 2.05) respectively (Table 1). Values are mean ± S.E.M; n = number of animals in each group; Significant difference from control and standard. P* = < 0.01, P** = < 0.001. Values within parenthesis represent percentage of control. 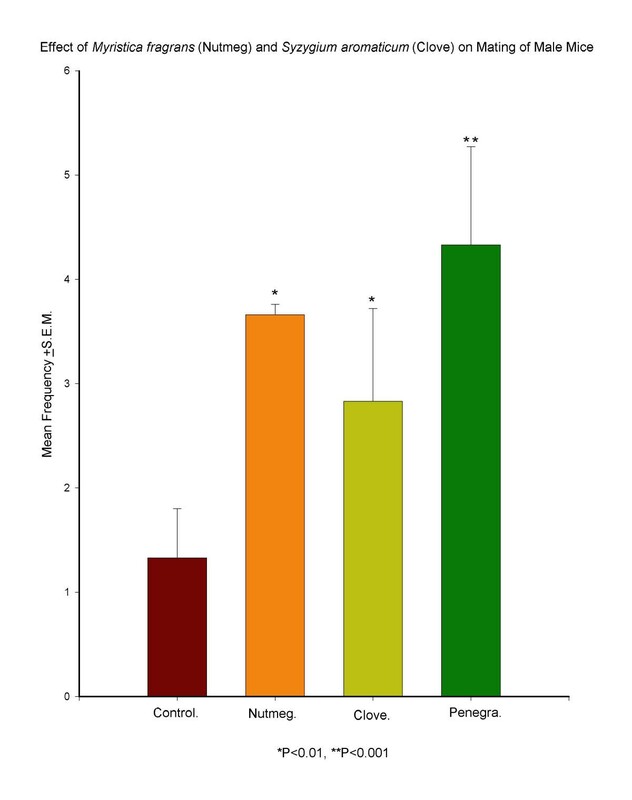 Administration of ethanolic extract of a single dose of Nutmeg and Clove, and Penegra resulted in the increase in the mating performance of the mice. Out of 6 control animals only 2 males mated (inseminated) 2 females and the remaining 4 males mated 1 female each during the overnight experimental period. Whereas, Nutmeg treated male animals mated 3 females each except two which mated 5 females each. In the Clove treated male animals 3 mated 2 females each, 2 mated 4 females each and remaining 1 mated 3 females each. In the Penegra treated animals 4 mated 5 females each and 2 mated 3 females each. The mean number of females (mean ± S.E.M.) mated by one male in control group was 1.33 ± 0.47 while it was 3.66 ± 0.10 (P < 0.01), 2.83 ± 0.89 (P < 0.01), 4.33 ± 0.94 (P < 0.001) in the groups treated by Nutmeg, Clove and Penegra respectively. 50% ethanolic extracts of the Nutmeg and Clove did not cause any mortality, when single doses (500 mg/kg) were orally administered. At this dose, which corresponds to unani clinical dose and on which aphrodisiac activity of the drugs was observed, there was found no gross behavioural changes. In ethnomedical practices, several formulations containing these spicy drugs are used for sexual function improvement. The present study revealed that the 50% ethanolic extracts of Nutmeg and Clove can significantly enhance male sexual activity in normal mice. In the present study, it was observed that the sexual behaviour of male mice with Nutmeg was greater than Clove. Whereas, it was found highly significant in the animals treated with Penegra. The study also revealed that the 50% ethanolic extracts of these drugs were devoid of any general conspicuous short term toxicity. However, since these drugs are clinically used in the Unani System of Medicine without any recorded toxicity, thereby suggesting that the short term use of these drugs for this purpose is apparently safe. Generally elevated testosterone level also enhanced the sexual behaviour in humans. Moreover, drugs induced changes in neurotransmitter levels or their action at cellular level could also change sexual behaviour . In this connection it should be noted that in ethno medical texts, spices especially Nutmeg and Clove are mentioned as nervous stimulants so the action of these drugs as sexual invigorators may be due to their nervine stimulating property. Further, nutmeg has also been reported to increase blood circulation in the body. The enhanced effect of Nutmeg than that of Clove, as observed in sexual behaviour of animals, may be owing to this property in conjunction with the nervous stimulating activity of the drug. Both the test drugs exhibited more increament of mating performance in mice in comparison with the increased sexual motivation. The standard drug Sildenafil citrate was used as a referent only for quantitative comparison and not for mechanistic purpose. For conducting the study the parallel experimental design is used. However, for more corroborative evidence of the drug's activity the twin crossover method may be used. The results are statistically significant. The authors are thankful to the Department of Ilmul Advia of A.M.U. Aligarh for providing all facilities to carryout the study. TA-Supervised the design and coordination of the study.